According to MADD, someone in America is killed by a drunk driver every 53 minutes. Every two minutes, someone is injured. In Florida, drunk driving currently causes 28 percent of all traffic fatalities. These figures are a stark reminder of how a negligent person can hurt innocent people and cause devastation on the roads. Many people associate drunk driving with DUIs, but this is just one aspect of an alcohol-related motor vehicle accident. Although a drunk driver will face criminal charges, the law also makes him or her responsible for the injuries and property damage he or she caused. A DUI is a criminal penalty imposed by the criminal courts, whereas the injury portion of the case is handled by the civil justice system, which compensates injury victims for their losses. In a wrongful death situation, the family members of the person who was killed can file a lawsuit on the person’s behalf against the negligent wrongdoer. Under Florida wrongful death law, the family members must be blood relatives of the deceased. These cases can be highly complex, which is why it is critical to work with the experienced wrongful death lawyers. You may be entitled to recover for the loss of financial support, services, love, and affection brought about by the death of your loved one. Read more on the Wrongful Death Act in Florida here. Any type of car crash can cause injuries. 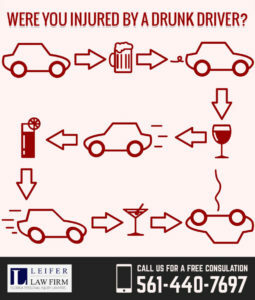 If you were hit by a drunk driver, there are several things you need to do right away. First, your health should be your top priority. Your doctor can treat your injuries and monitor your condition as time passes. Your doctor can also document your injuries, which is important in your personal injury case. Keep in mind that some injuries take time to show symptoms, so it’s important to follow up with all health care providers. Call a knowledgeable Boca Raton personal injury attorney. In these types of cases, time is of the essence. Your lawyer will help you preserve important evidence and explain your options.Your attorney will also handle the insurance company on your behalf to ensure any settlement offer you receive fully and fairly compensates you for your injuries. Any kind of personal injury can leave you with long-term damage, both physically and mentally. When you are hurt by a drunk driver, it may take you a long time to feel safe again. You may hesitate to get behind the wheel or even get in a vehicle at all. If you or a loved one has been injured in a drunk driving crash, or you have lost a family member in this type of collision, and you are suffering from this type of accident, then it’s important to contact a Boca Raton personal injury attorney as soon as possible. An experienced wrongful death and personal injury lawyer will evaluate your case and help you determine the best course of action. These are complex matters that involve a lot of issues. Your accident lawyer should shoulder the legal burden so you can focus on your recovery. Don’t let a drunk driver stop you from living your life. Get help from a lawyer who can help you reclaim your health and your overall well-being. Visit here to get started with a Boca Raton personal injury lawyer today.